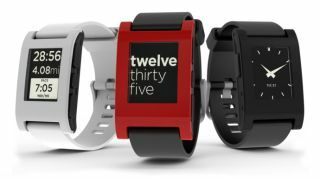 Pebble, the original Kickstarter-funded smartwatch, will become available in the UK later this month courtesy of Currys and PC World, Amazon, Firebox and O2 - the latter of which is toting an exclusive Cherry Red version. It's the first time the e-ink smartwatch has been available to buy on these shores and Pebble is firming up its offering in the face of competition from the Apple Watch and Android Wear with a price drop. The original Pebble smartwatch will now set you back a mere £99 while the newer and shinier Pebble Steel that launched in January will drop at £179. To bring its watches in line with the current crop of wearables, Pebble has also pushed out a new update that activates fitness tracking and sleep activity. Both models are able to utilise the new update and third-parties are taking advantage. Misfit, makers of the Shine activity tracker and Jawbone both have Pebble apps in the pipeline. Meanwhile Swim.com also has an app on the way and because the Pebble is waterproof, you'll be able to take it for a few lengths. There are currently over 4,000 apps built specifically for the watch on the Pebble store. Read our first impressions of the Apple Watch.